Landon Chapman of Brandon, Mississippi has always said he was “too much for Mississippi” and a recent opportunity through a connection with the Ole Miss Women’s Council (OMWC) has led him to fulfilling his life dream, at just the age of 19. 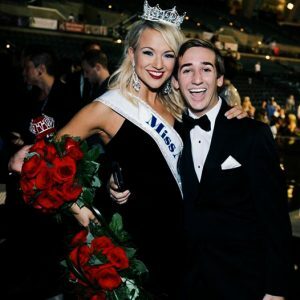 Chapman recently just completed a two-week internship with the Miss America Organization in Atlantic City, NJ where he quickly became known as “Landon the Intern” and became an internet sensation known through the hashtag #landontheintern. Had it not been for Chapman’s scholarship thru the OMWC, he would not have attended Ole Miss. Chapman recognizes each step that’s led to another step. Haskell, who currently serves as the OMWC Chairwoman, was asked by then program coordinator, Bonnie Brown to help shepherd Chapman with an opportunity in entertainment. Haskell’s husband, Sam Haskell is the current CEO of the Miss America Organization. Chapman’s duties were to help socialize the two-week event and competition on the internet. He quickly took to the phone app, SnapChat to keep Miss America fans in the know and up to the minute with his reports. The 52 contestants equally came to admire #landontheintern and donned him with his own personal pageant sash, as the “53rd Contestant” on stage during the preliminary rounds the week of the competition. Chapman will be heading to the Miss America “Homecoming” in Little Rock this month to welcome home the newly crowned 2016 Miss America, Savvy Shields who represented Arkansas in the recent pageant. Next on Chapman’s list? He says he feels compelled to double major. In addition to his Integrated Marketing Major, he’d like to now add broadcast journalism to his future. As for the top thing he learned during his internship was “no dream is too big,” he says.